In the vein of Tuesday's Year in Progress post, here's another exterior-related project that we tackled last fall. For some odd reason, the light in our garage is connected to the switch that controls the light in the stairwell that leads to our basement living spaces. Consequently, if we're downstairs at night, our garage is lit up like a lantern -- with all of our tools and junk illuminated for the world to see. The previous owners tackled this issue by tacking polyester lace (one of their favorite fabrics !) 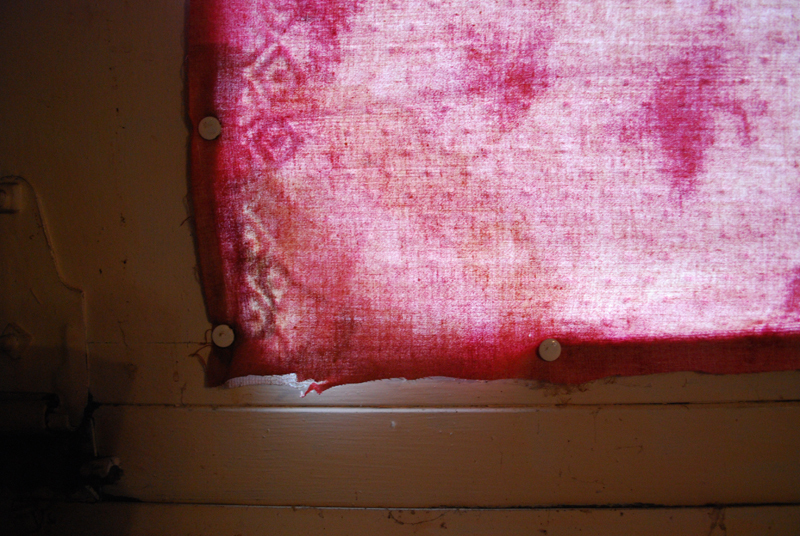 and a pink printed textile over the windows. While I appreciate the thought, it wasn't my favorite solution. Not only was pink not my color of choice for this application but, after years of use, the fabric had also become stained and dirt filled. I had seen John & Sherry Petersik of Young House Love tackle a few projects with privacy film (like this and this) and thought it would be a great alternative to all of this pink. This was for two reasons: 1) I knew it would still provide privacy while allowing more light to enter the garage during the day, and 2) it would provide a more neutral appearance from the street. 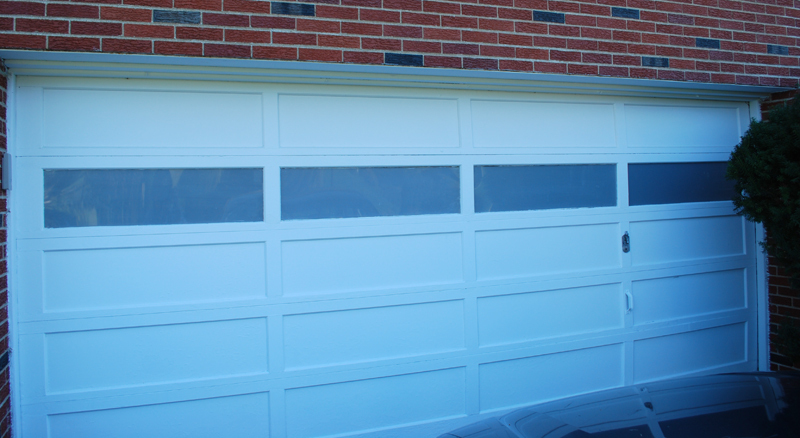 We purchased this Gila frosted privacy film and an installation kit from our local Home Depot and got down to business. Removing the old fabric only took about 10 minutes since it was just attached with thumbtacks. Once the fabric was removed, the natural light revealed a lot of the dirt on the inside of the door. I decided to go ahead and spend some time wiping down the inside of the door with some Simple Green and a sponge. Once I had cleaned all the glass thoroughly with glass cleaner, we were ready to apply the film. If you're curious about how to apply it, John & Sherry made this helpful video detailing the process (the instructions that came with the film were also pretty straightforward). Alex helped me cut and apply most of the panels. It was nice to have two sets of hands since our panels were on the longer side. In the end, I think that the privacy film accomplished just what I had hoped. 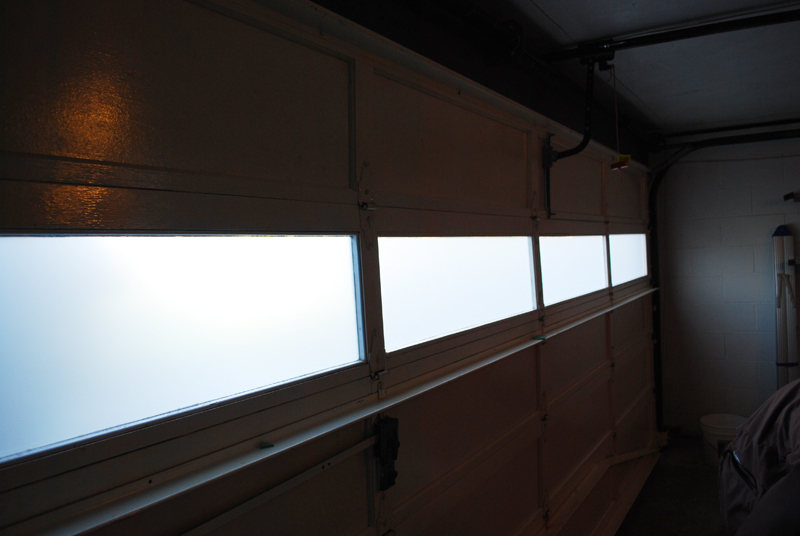 It provides just enough privacy while still helping to keep the garage light and bright during the day. While it did reveal some flaws in the glass/plexiglass panels on the garage door, I think it was an excellent and very affordable solution. Doesn't it look so much better? Between cleaning and application, the project took most of an afternoon. I think it has a pretty big impact for only taking a few hours. Quick change projects are good for the soul :).